Technical features like precision controlling down to the millimetre with “zero gap” are available from us, as are platforms and podiums with custom contours and buffer protection. High-quality aluminium ensures we can provide a lightweight construction and easy handling. We construct every special design based on your individual needs. 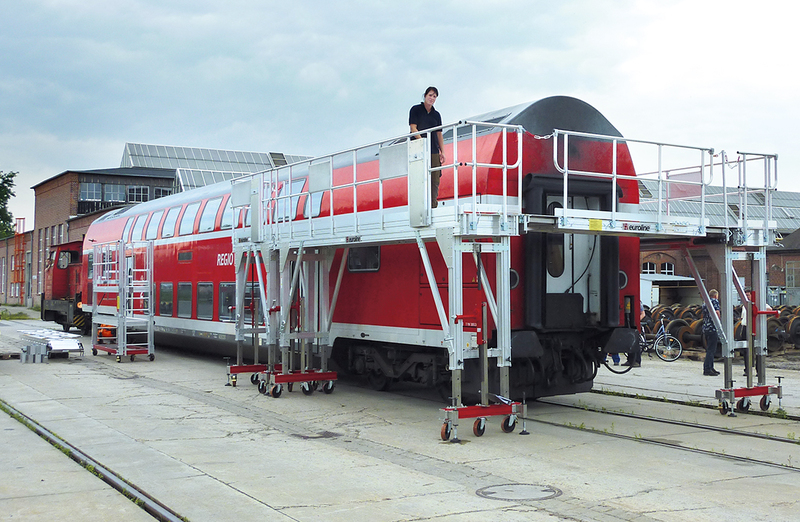 Stationary roof working platforms ensure safe access and ergonomic work on the roof or rooftop areas of trains. euroline provides professional equipment for flexible and safe ICE maintenance, as well as for maintenance tasks with zero gap on railcars / locomotives or two-story passenger cars. Short set-up times reduce downtime. Contour adjustments offer enormous flexibility with maximum occupational safety. Depending on your hall layout, rooftop work stations are divided into individual podiums (modular system) and the correct installation variation (standing on floor, suspended from ceiling, or cantilever arm technology) is selected. Mobile roof working platforms with height adjustment are optimal for convenient and quick repair work. Folding railings and telescoping guardrails ensure you can work safely on the roof. 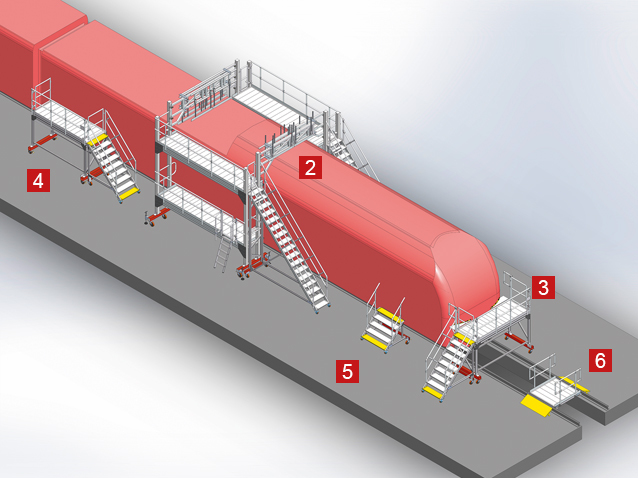 Mobile servicing platforms are versatile and expandable thanks to our modular system. These servicing platforms can be used for all work in the front area, such as the front windscreen, windscreen wipers, lighting, and displays. euroline constructs front working platforms for all train and wagon types, and all track widths. Cassette platforms for contour adjustment offer the perfect solution for working on the front sides of rail cars. 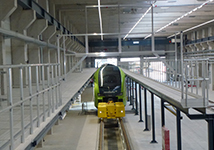 For processes on normal hall floors, rails, or elevated tracks, a 2-way running gear can also be offered as an option. Side working platforms provide access for work along the train, on glass, and on doors. They are available with height adjustment and various access variations. Access solutions to meet your needs are constructed specifically for your application. euroline offers fixed or mobile stairs, adjustable height access points, emergency ladders, and much more. 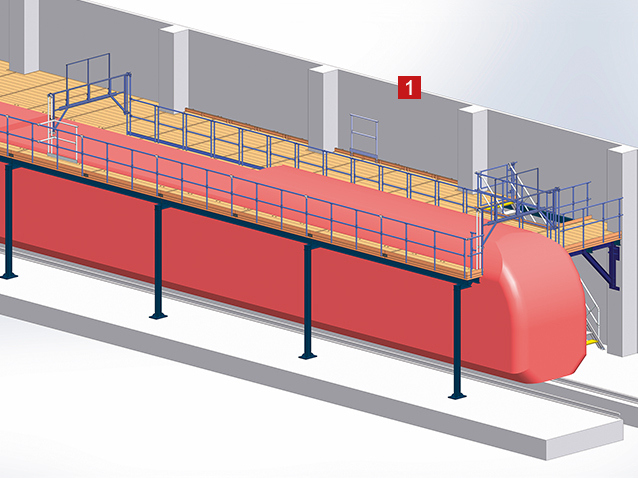 Pit covers can simply be placed between the rails. They are fastened on the side with quick clamps. Attachable railings provide side protection. Track transitions are available in all track widths. Plastic guides allow them to be easily slid between the rails. Fixed railings or attachable railings are available. We are also happy to construct custom transitions for track pits. This is intended to allow access to various areas of the railway vehicles, which is why stationary and mobile accesses are necessary. All structures are manufactured in compliance with the applicable DIN EN ISO 14122 and in compliance with the regulations of the Quality Management System as per DIN EN ISO 9001:2008.